“On May Day, suddenly “the kyng departed having not above vi. persons with him, and came in the evening from Grenewyche to his place at Westminster” (Hall 268). Anne was confined to her chamber. “Of this sodayn departynge many men mused, but moste chiefely the queen” (Hall 268). The “seconde daie of Maie, Mr. Norris and my Lorde of Rochforde were brought to the Towre of London as prisoners; and the same daie, about five of the clocke at night, the Queene Anne Bolleine was brought to the Towre of London” (Wriothesley 36). 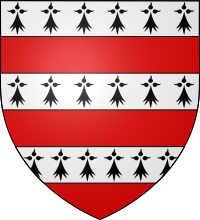 To clarify the prisoners and their Court positions–Henry Norris, Groom of the Stole; Sir Francis Weston, Privy Chamber member; William Brereton (also known as Bryerton), Privy Chamber member; and Mark Smeton (sometimes spelled Smeaton), a musician. The indictments were made for five men. It is contended that Norris, Weston and Bryerton could not escape punishment as Henry had “no intention, after the death of Anne, to effect a reconciliation with Rome, the three last named might have been allowed to escape; but if he wished to keep a middle course it was his interest to eliminate form the party of the reformation as many as possible of those who might drive it to extremes, and thereby force the government to lean to the other side” (Friedmann II 261-262). On a more personal level, the men may also try to avenge the wrongs against them and the Queen. It was better that they die. 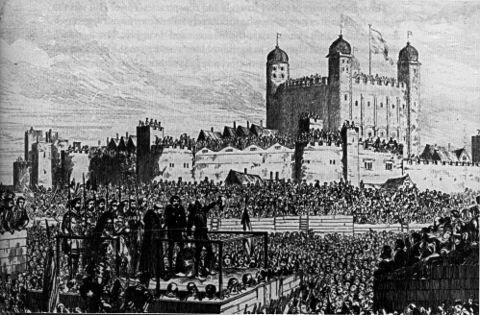 “Besides the persons who were actually sent to prison, a good many others were bound under heavy fines to present themselves before Cromwell and the royal council. They were thus kept in suspense and fear, and could not exert themselves in favour of the accused” (Friedman II 261). Anne’s enemies “searched eagerly for evidence against her, and examined every one who seemed likely to know anything to her disadvantage. Sir William Fitzwilliam and Sir William Paulet, aided by Sir Edward Baynton, seemed to have distinguished themselves in this way at Greenwich, where Anne’s personal servants had remained” (Friedmann II 259). 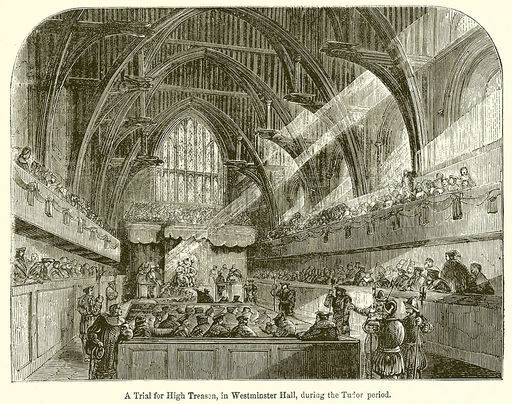 Thomas Wyatt probably was arrested to provide evidence, not to be condemned. 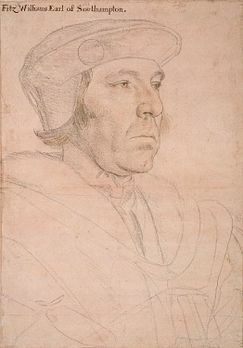 When Cromwell discovered that he had not been in close communication with Anne for years, he wrote Sir Henry Wyatt “that the young man would be spared. It was decided, too, that Sir Richard Page, who was connected with the Fitzwilliams and the Russels should be allowed to escape” (Friedmann II 262). Sir Henry Norris had been “in the King’s favour, and an offer was made him of his life, if he would confess his guilt, and accuse the Queen. But he generously rejected that unhandsome proposition, and said that in his conscience he thought her innocent of these things laid to her charge but whether she was or not, he would not accuse her of any thing, and he would die a thousand times rather than ruin an innocent person” (Ellis 65-66). Mark Smeaton was the only man who was arrested who “confessed to inappropriate behavior toward the Queen” (Burnet 110-111). His confession was the only solid evidence that Cromwell had. 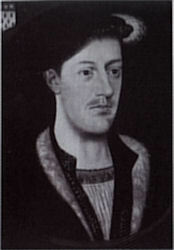 It has been suggested that Smeaton was promised a pardon if he pled guilty and implicated Anne. There is speculation that he confessed under torture, an interrogation technique that would have been readily used against the commoner. Because he did not recant at the scaffold, there is a theory that, in the exchanges he had with Anne (which she talks about while in the Tower), he responded familiarly and his haughtiness earned him a rebuke. Perhaps realizing he was not going to be pardoned, Smeaton decided to gain revenge on Anne by confessing to adultery (Davies). If revenge was his motive, he was successful. While at Greenwich Anne learned that Norris and Smeaton had been arrested. “Combining these facts with Henry’s growing coldness to herself, and his increasing affection for Jane Seymour, Anne began to fear that she would have to take the same way. She was absolutely without means of defence” (Friedmann II 252). 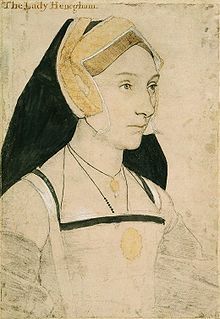 Anne herself would try to put a positive spin on her situation and claim that “the most par of Yngland prays for me, and yf I dy you shall se the grettest punishment for me withyn thys vij yere that ever cam to Yngland,’ & then she syad I shall b ein heaven, for’ I have done mony gud dedys in my days…” (Cavendish 223-225). This was not the case. 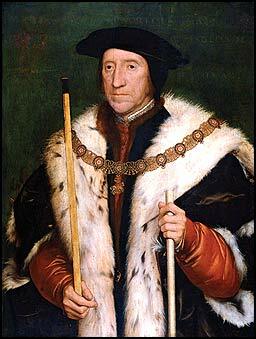 With Henry away at Westminster, she could not use her influence on him. Coupled with his physical distance, most courtiers went with him including not only her enemies but also her allies. Friedman implies that Anne’s brother, Lord Rochford, would use his talents to defend his sister in any way he could which explains his arrest. Her father “had always disapproved of his daughter’s bold and violent courses. There was, therefore, no reason to fear that he would try to defend her” (Friedmann II 254). Anne could not flee from her confinement at Greenwich as this would have proven unsafe to do if not impossible without resources and it would have been an admission of guilt (for whatever was her crime). The Queen was not left in the dark for long. 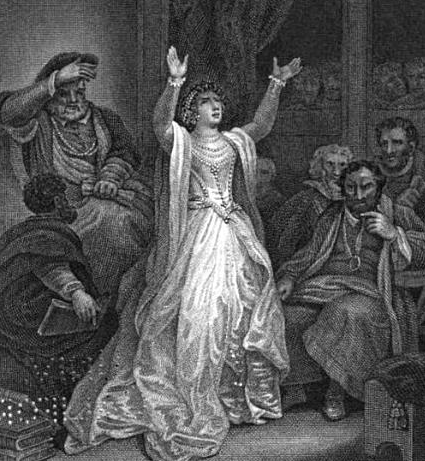 On May 2, 1536, she was summoned before the council. Anne would later claim that she “was creuely handeled …. at Greweche with the kyngs counsel” (Cavendish 223-225). The Queen was interrogated and charged with treason and adultery. Protestations of innocence had no effect and she was arrested and told she would be taken to the Tower. “At two o’clock her barge was in readiness, and in broad daylight, exposed to the gaze of the populace who had assembled on the banks or in boats and barges, she was carried along the river to traitors’ gate” (Friedmann II 253). Spanish Ambassador, Eustace Chapuys, was giddy when he wrote his official report on the day of Anne’s arrest that it was “still more wonderful to think of the sudden change from yesterday to today, and the manner of the departure from Greenwich” (Gairdner X 782). His exuberance was not masked when he said things had “come to pass much better than anybody could have believed, to the great disgrace [of the Concubine], who by the judgment of God has been brought in full daylight from Greenwich to the Tower of London, conducted by the duke of Norfolk, the two Chamberlains, of the realm and of the chamber, and only four women have been left to her. The report is that it is for adultery” (Gairdner X 782). Upon arriving at the Tower Anne exclaimed loudly, “I entered with more ceremony the last time I came” (Hume 64). 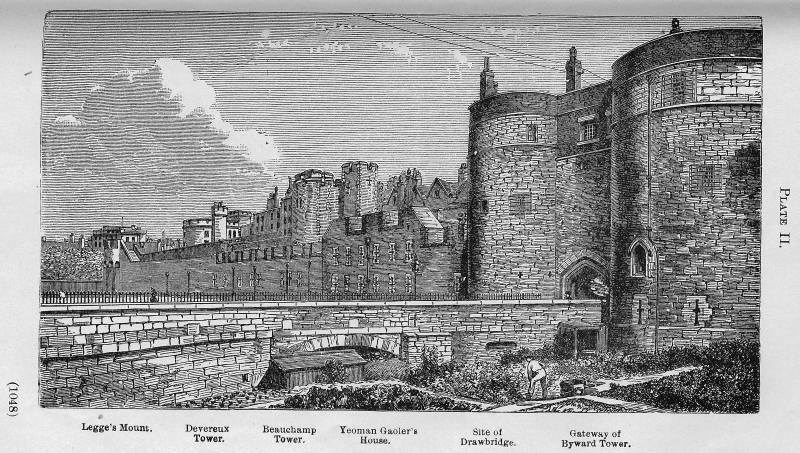 She maintained her composure up to the time the gates were closed when she asked the Constable of the Tower, William Kingston, if he “was leading her to a dungeon” (Friedmann II 255). When he assured her he was taking her to the rooms she occupied before her coronation, “this somewhat relieved her distress. ‘It is too good for me,’ she exclaimed.” Then her nerve did falter when she came to the “court gate, entering in, she fell downe on her knees before the said lords, beseeching God to helpe her as she was not giltie of her accusement, and also desired the said lords to beseech the Kinges grace to be good unto her, and so they left her their prisoner” (Wriothesley 36). Once in her apartments she made inquiries about her brother, she asked for the eucharist to be brought in to a room nearby so that she could pray, and she “began to assert her innocence of the crimes with which she was charged” (Freidmann II 256). “Anne herself was not examined any further. At first orders had been issued that, except in the presence of Lady Kingston, she was to hold no communication with the four women deputed to serve her; but it was soon decided that this would neither be practicable nor expedient. So her attendants were allowed to talk with her, on condition that everything of any importance which she might say to them should be reported to the constable. In a state of hysterical excitement Anne was unable to weigh her words and to control her tongue” (Friedmann II 259). Sometimes “she laughed, and at other times she wept excessively; she was also devout and light by turns; and sometimes she stood upon her vindication, and at other times she confessed some indiscretions, which she afterwards denied” (Burnet 110). “On the morning after her arrest she spoke of Noreys, and told Mrs. Cosyns, one of her attendants, of the conversation she had had with him. 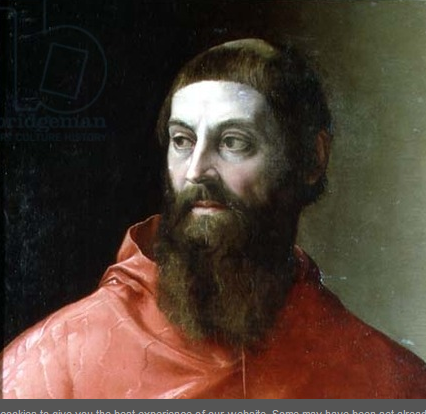 She then talked of Weston, whose indiscretion she seemed greatly to fear” (Friedmann II 259). This whole conversation (and those that ensued) was immediately reported to Kingston, who in his turn sent an account to Cromwell—several are reproduced below. “Thy sys to advertyse you upon my Lord of Norfolk and the kyngs counsell depart[inge] from the Towre I went before the queen in to hyr lodging, & [then she] sayd unto me, M. Kyngston, shall I go in to a dungyn? Now, madam, y[ou] shall go into your logyng that you lay in at your cornonacion. It ys to gu[de] for me, she sayd, Jesu, have mercy on me; and kneled downe wepyng a [great] pace, and in the same sorow fell in to agret lawyng, and she hathe done [so] mony tymes syns. 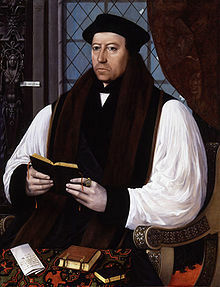 And then she desyred me to move the Kyngs hynes that she [myght] have the sacrament in the closet by hyr chambr, that she my[ght pray] for mercy, for I am as clere from the company of man, as for s[yn, sayd she as I] am clere from you, and am the kyngs trew wedded wyf; and then sh[e sayd] M. Kyngston, do you know wher I am here, and I sayd, Nay, and then [she sayd] when saw you the kyng? And I sayd, I saw hym not syns I saw [him in] the Tylte yerde, and then M. K. I pray you to tell me wher my [Lord Roch]ford ys? And I told hyr I saw hum afore dyner in the cort. O [where ys] my set brod’er? I sayd I left hym at York place, and so I dyd. I [hear say, say]d she, that I shuld be accused with iij men; and I can say [no more but] nay, withyowt I shuld open my body; and there with opynd [her gown saying, O Nor]res, hast thow accused me, thow ar in the Towre with me, & [thou and I shal]l dy to gether: and, Marke, thou art here to. O my mother, [thou wilt dy] for sorrow, and meche lamented my lady of Worcet, for by ca[urse her child] dyd not store in hyr body, and my wyf sayd what shuld [be the cawse, she] sayd for the sorrow she toke for me: and then she sayd M. K[ingston, shall I dy] with yowt just; & I sayd, the porest sugett the kung [hath had justis, and] ther with she lawed. All thys sayings was yeter ny[ght]……. & thys moryng dyd talke with mestres Cousyns [and said that Nor]res dyd say on Sunday last unto the queens amn[er, that he wold sw]ere fro the queen that she was a gud woman. [And then sayd Mrs.} Cosyn, Madam, why shuld ther be hony seche maters [spoken of? Mary,] syad she, I had hym do so, for I asked hym why he [went not through with] hys maryage? And he made ansur he would tary [a time. Then said she, you’ loke for ded mens showys; for yf owth cam[e to the king but good,] you would loke to have me; and he sayd, yf he [should have any soch though,] he wold hys hed war of; and then she sayd, [she could undo him if she wold,] and ther with thay fell yowt. Bot [she said, she more feared Weston; for] on Wysson Twysday last [Westong told he]r that Nores cam more u[nto her chawmbre for her then…. Wher I was commanded to charge the gentlewomen that y gyf thaye atende apon the queen, that ys to say, Thay shuld have now commynycaseon with hyr, in lese my wyf ware present, and so I dyd hit, notwithstaundyng it canot be; for my lady Bolen and mestrys Cosyn lyes on the queens palet, and I and my wyf at the dore with yowt, so that thay most nedes talke that be without” (Cavendish 223-225). Anne’s natural intelligence would have sparked in her the realization that anything she said or did in confinement would most likely be reported to the authorities. Yet, she could not keep her chaotic thoughts to herself and spoke of her previous encounters with the accused men. To which Kingston would add postscripts explaining her further revelations. He informed Cromwell that “syns the making of thys letter the queen spake of Weston that she had spoke to hym by cause he dyd love hyr kynswoman Mrs. Skelton and that she sayd he loved not hys wyf; and he made anser to hyr again that he loved won in hyr howse bettr than them bother; she asked him who is that? To which he answered that it ys your self; and then she defied hym” (Cavendish II 217-220). 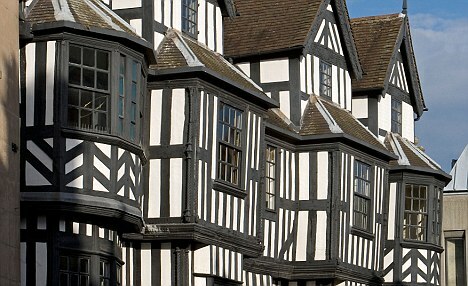 Days later Kingston wrote to Cromwell concerning the discussion of Jane Boleyn, and Anne’s further encounters with Mark Smeaton and Thomas Wyatt. “Quene said unto me that same nyght that the Kyng wyst what he dyd when he put such ij. abowt hyr as my lady Boleyn and Mestres Cofyn; for thay cowd tell her now thynge of my Lord her father, nor nothynge ellys, bot she defyed them alle. 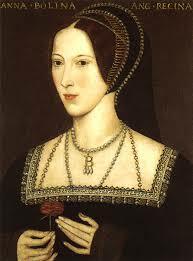 But then upon this my lady Boleyn sayd to hyr, Seche desyre as you have had to such tales hase browthe you to thys, and then sayd Mrs. Stoner, Mark [Smeaton] ys the worst cherysshe of hony an in the house, for he wayres yernes. She sayd that was because he was no gentelman; bot he wase never in my chamber but at Winchester, and there] she sent for hym to play on the virginals, for there my logynge was above the King’s for I never spake with hym syns bot upon Saterday before Mayday; and then I fond hym standyng in the ronde wyndo in my chambre of presens. And I asked why he wase so sad, and he ansured and sayd it was now mater; and then she sayd, You may not loke to have me speke to you as I shuld do to a nobulle man by cause you be aninferor person. No, no, madam, a loke sufficed me, and thus fare you welle. She hathe asked my wyf whether hony body makes thayr beddes, and my wyf ansured and sayd, Nay, I warant you; then she sayd thay myght make balettes well now, bot ther ys non bot . . . . . . de that can do it. Yese, sayd my wyf, Master Wyett by . . . . . . . sayd trew. . . . . . my Lorde my broder wille dy . . . ne I am sure thys was as . . . tt downe to dener thys day. Will’m Kyngston” (Gairdner X 798).